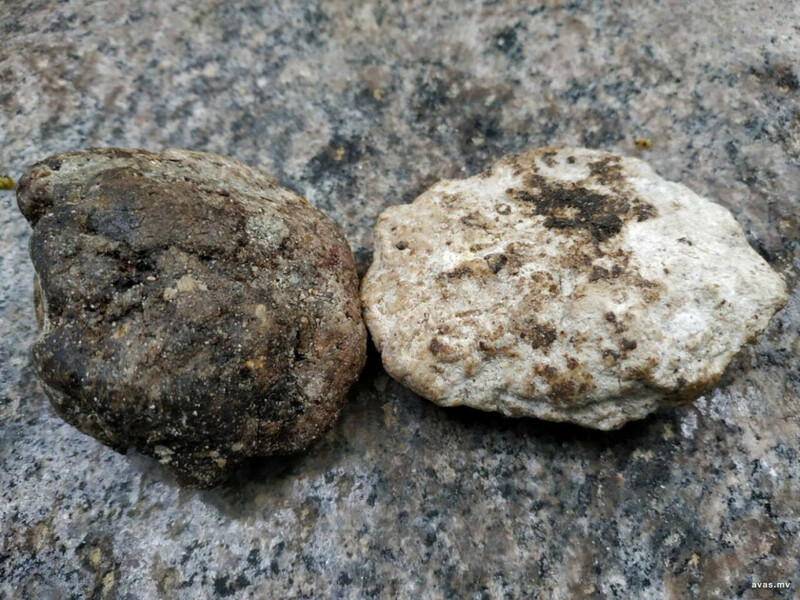 Two lumps of ambergris were discovered by four young men from Innamaadhoo island of Raa atoll, who were out fishing on Sunday. Innamaadhoo island council revealed that the lumps weigh approximatley 200g each. One of the lumps is believed to be a valuable white ambergris, locally known as Hudhanbaru. The lumps will be sent to capital Male' for further testing. While two ambergris has been spotted near Innamaadhoo, a man out fishing from Feevah island of Shaviyani atoll had last week discovered an enormous ambergris weighing a whopping 82kg. Ambergris is a stone secreted by sperm whales and are used in making perfumes and is extremely rare. It is considered valuable because a block of it can cost up to $70,000 and is a very important ingredients in making the smell of perfume lasts longer.